Takes 75 Minutes , serves 4. Preheat oven to 375°F. Cut caps off of peppers and reserve. Trim away seeds from inside of each pepper and stand peppers upright in an 8x8” glass casserole dish. Set aside. Heat tomato sauce and simmer on low until use. Place cooked quinoa, beans, zucchini, asparagus and basil into a medium-sized bowl. Set a medium-sized skillet on medium-high heat. Once hot, add oil and allow to come to temperature, noted when oil shimmers. Cook onions and garlic until soft and translucent. Add mushrooms and celery, allowing it to cook for a minute before adding the carrot and sweet potato. Sauté until just slightly soft. Transfer cooked vegetables into bowl of raw vegetables and stir together. Adjust with salt and pepper to taste. Transfer stuffing into peppers, packing it down firmly. Spoon tomato sauce onto the stuffed peppers and into the bottom of the casserole dish. Place caps onto the peppers and cover the dish loosely with tinfoil. Transfer to oven and bake for 45 minutes. Remove from oven and discard tinfoil. Increase oven temperature to 400°F. Return peppers to oven and bake for an additional 15 minutes. Remove from oven and serve in soup plates, spooning tomato sauce from the dish onto each. Easy. Vegan. Delicious. Gluten-free. Just a few key words to describe these VEGETARIAN STUFFED PEPPERS that the whole family will enjoy. 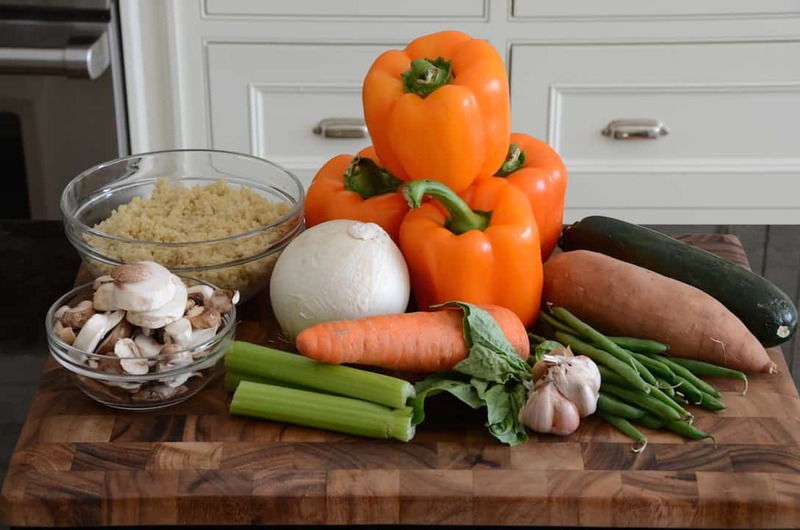 I suggest you add these VEGETARIAN STUFFED PEPPERS to your weekday meal rotation, not only for their ease of preparation but also for being fabulously healthy and 100% vegetarian, vegan and gluten-free. 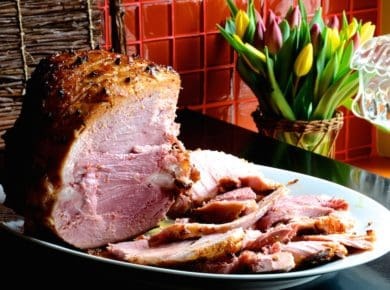 Even with all that going for them, they have a memorable fresh taste and are light on the tummy. That’s pretty perfect! 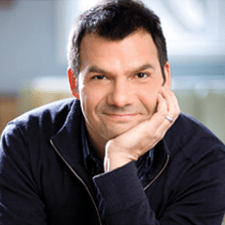 Before you continue, please remember to bookmark this page for future reference – judging by how well they’re received whenever I make them, you’ll be coming back to this recipe often. And feel free to PIN this page to one of your PINTEREST boards for future reference! 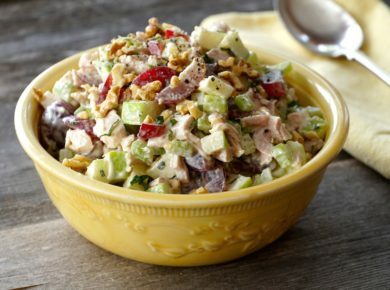 Before I list the highlights of this dish, let me first offer a suggestion on how to approach it – make this recipe your own. 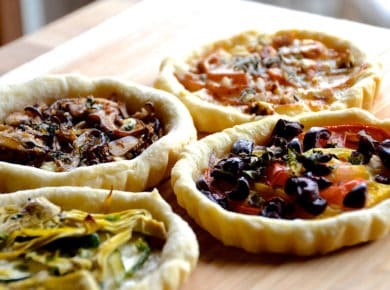 Aside from baking them as suggested, and for sure spooning a vegan version of our RICH TOMATO SAUCE on top, I encourage you to use your imagination and build your own unique flavour profiles, selecting the vegetables you most enjoy. 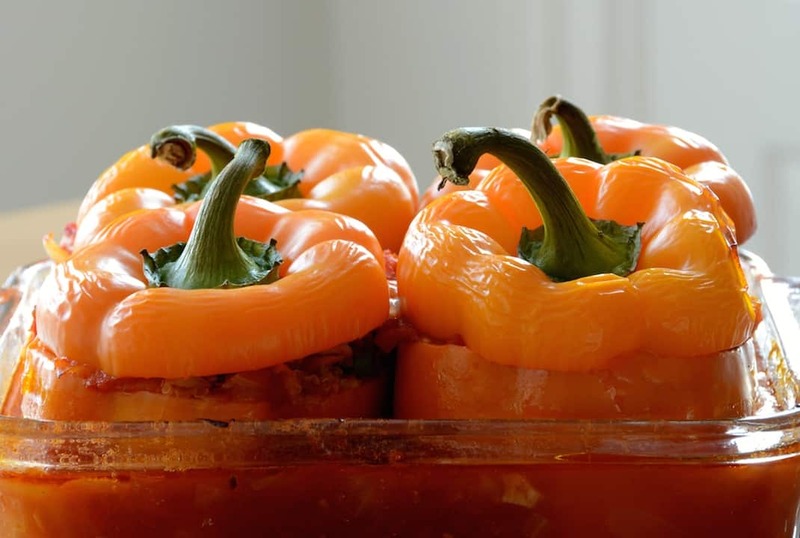 BELL PEPPERS – Red, green, yellow or orange bell peppers are an excellent source of vitamins A and C plus dietary fibre. 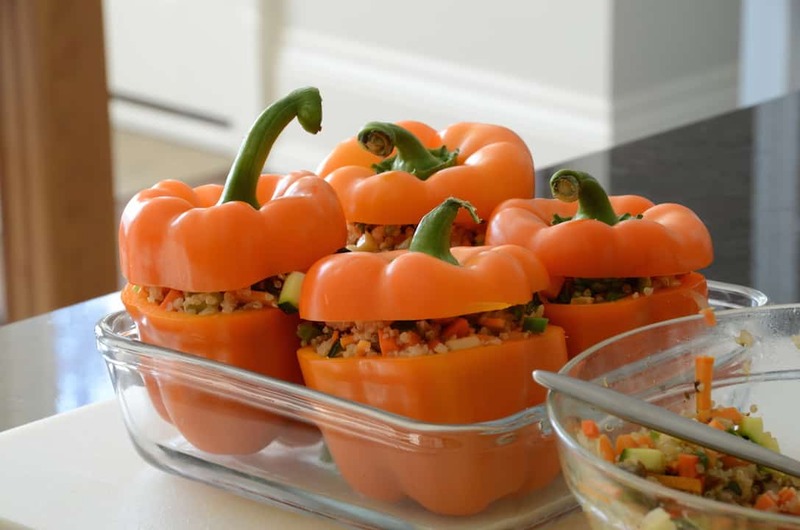 Ultimately though, bell peppers are key to this recipe for their appearance and function. The colours you pick will be key to the bold and beautiful presentation. 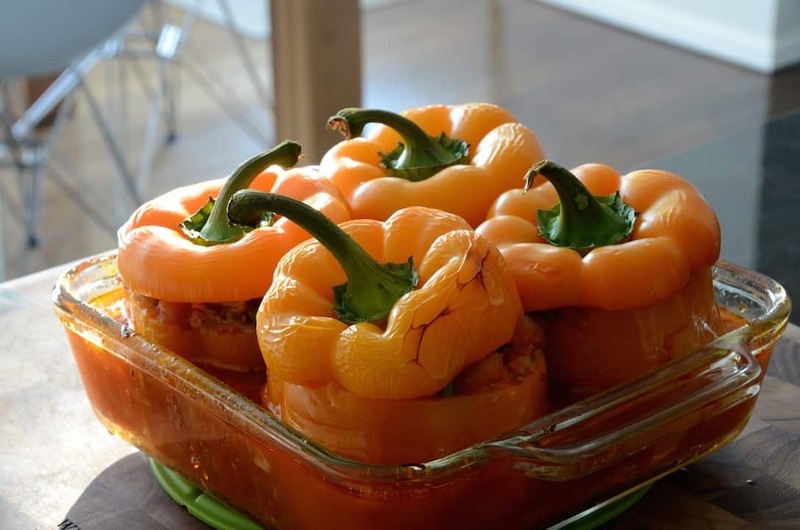 The shape and hollow interior of the peppers are the perfect vessels for our stuffing. 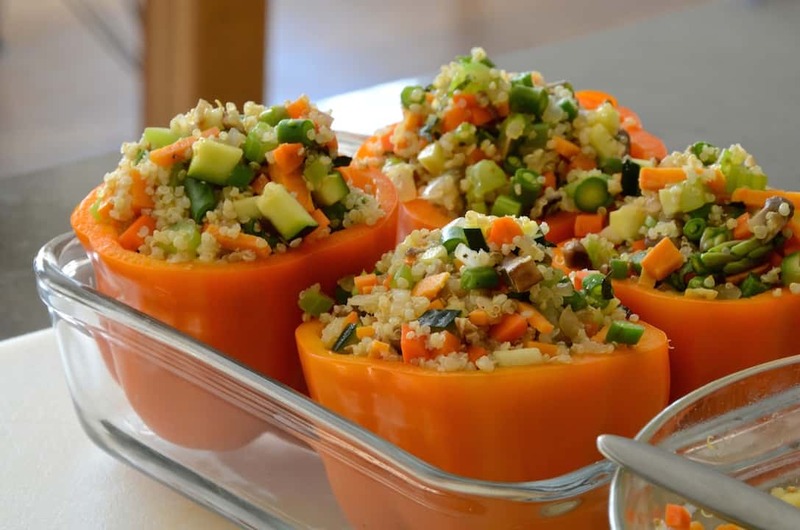 QUINOA – Although I’m a big fan of stuffing peppers with the traditional meat and rice combination, quinoa seemed like an ideal option for this vegetarian version. Not only is this ancient grain jammed with protein, it’s also gluten-free. Cook the quinoa beforehand by simply steaming or boiling it, and remember that it almost doubles in size when cooked (use ¼ cup of cooked quinoa per pepper as a guide). 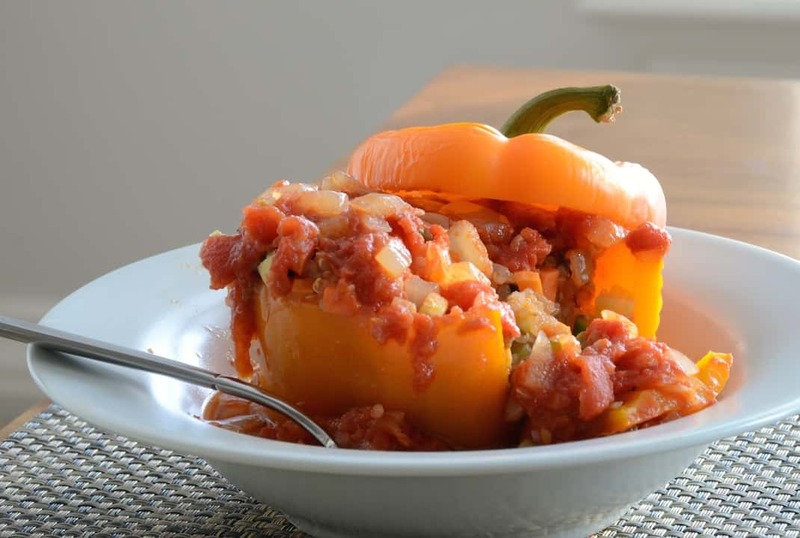 VEGETABLES – I’ve come to appreciate a combination of both raw and cooked vegetables in these stuffed peppers to add to their flavour profiles. I like to sauté onions, garlic, mushrooms and celery to bring out their flavour, as well as root vegetables and sweet potatoes to soften them up a bit. 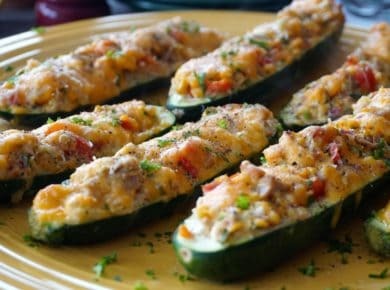 Additional vegetables such as zucchini, asparagus, green and yellow beans, tomatoes and corn can be added to the stuffing mix raw; they’ll soften up nicely when the peppers are baked. 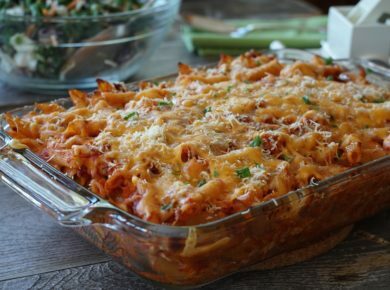 TOMATO SAUCE – The addition of a rich tomato sauce is the perfect topper for these beauties. Head HERE to watch our 1-minute City Slicker video on how to make this favourite sauce, BUT swap out the butter for canola oil to create a dairy-free version that will satisfy all the vegans out there. 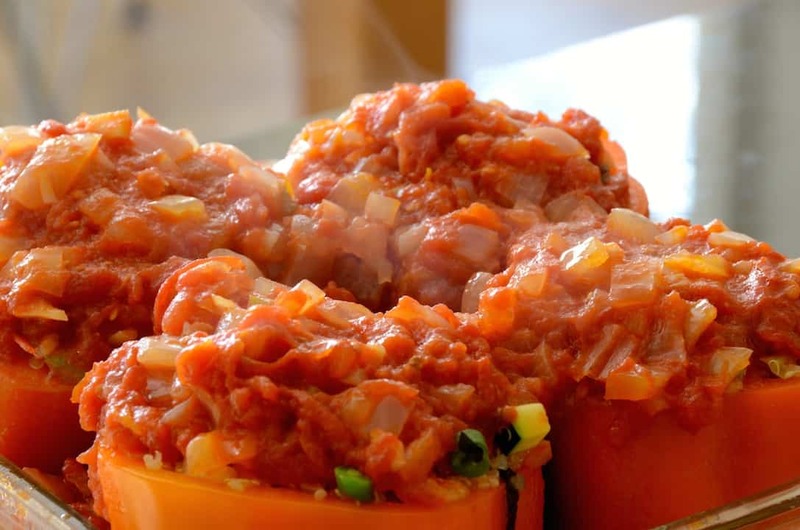 COOK TIME – Baking our stuffed peppers for 45 minutes at 375°F, followed by a final 15 minutes with the oven boosted to 400°F yields peppers that still have a bit of bite to them. Feel free to adjust the cook time and bake longer if you’d like them a bit softer. Back in the day, I used to serve these VEGETARIAN STUFFED PEPPERS with a dollop of cream or yogurt to add a bit of rich, creamy flavour. We’ve omitted this step in keeping with our objective of presenting a completely vegan version, but again, feel free to enjoy it as you wish. Looking for something to serve with these? How about a tasty cup of soup before digging into your peppers? Try our CURRIED SQUASH SOUP WITH COCONUT – it’s fabulous too! 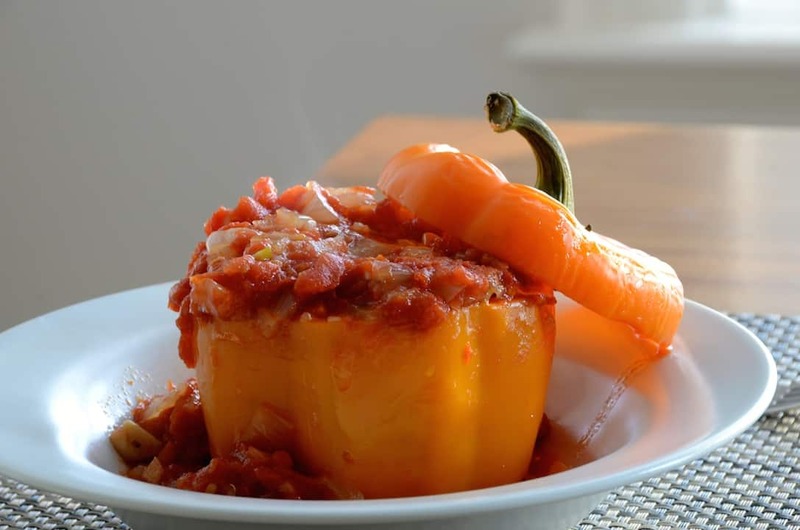 These easy-to-prepare VEGETARIAN STUFFED PEPPERS are a healthy alternative for your next meal. Enjoy!